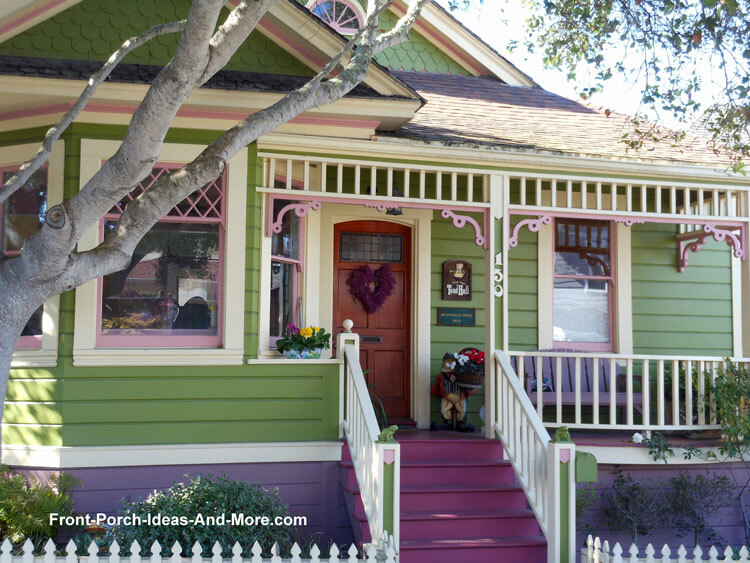 Pacific Grove California is a treasure chest full of beautiful scenery and front porch ideas. 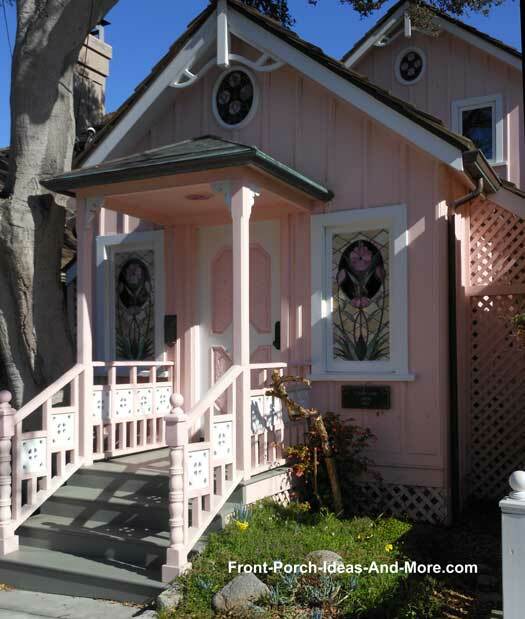 Often called Butterfly Town USA, Pacific Grove is also known for its ornate wooden cottages, many of which have been restored to their original design. 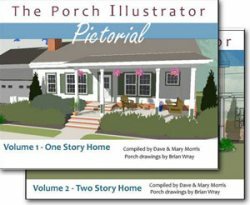 Mary and I spent several days in Pacific Grove to bring you some really ideal small front porch designs and ideas, many of which you will be able to replicate for your own home. 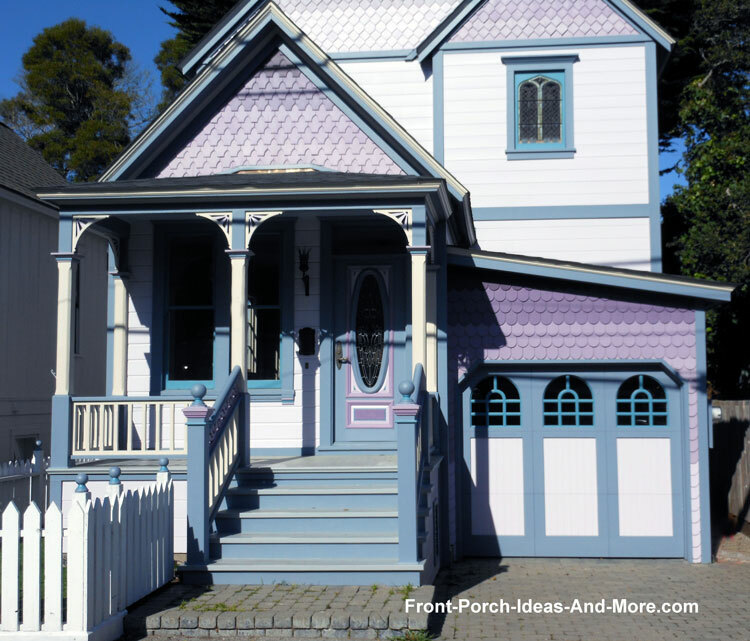 We found so many things to share with you, the first being how color is used to create both curb appeal and lots of charm. 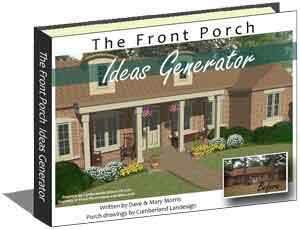 This works especially well on small porches as you will see from our photos below. 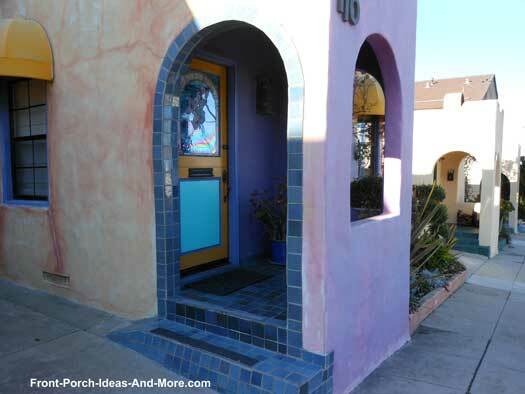 The right color combination can put a lot of pizzazz in a small porch as seen in our photos of Pacific Grove California front porches. 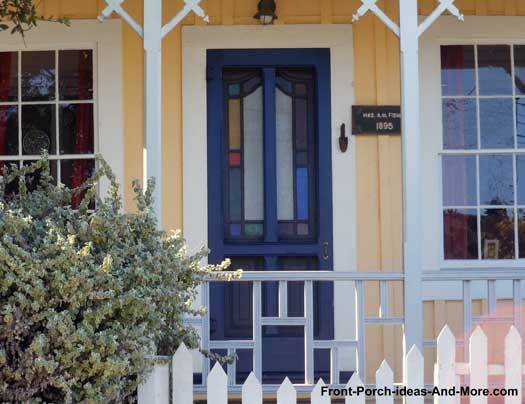 Wanting to change the color of your porch? Start by finding a little inspiration. Do you like complementary colors (contrasting) like me or monochromatic colors that are one or more shades of the same color? Often times working with various shades of the same color can produce beautiful results. Next, determine what type of visual impact you would like to create. 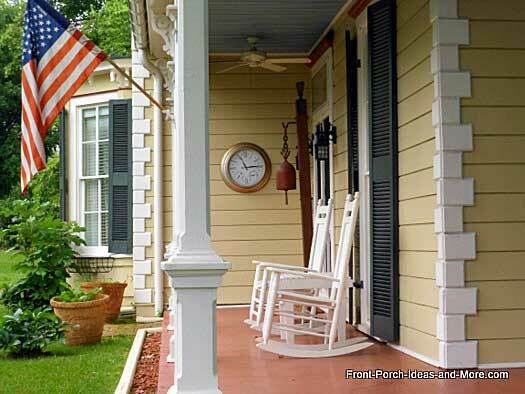 Is it bold like some of the colors on porches pictured here or would you rather opt for a more subtle impression? 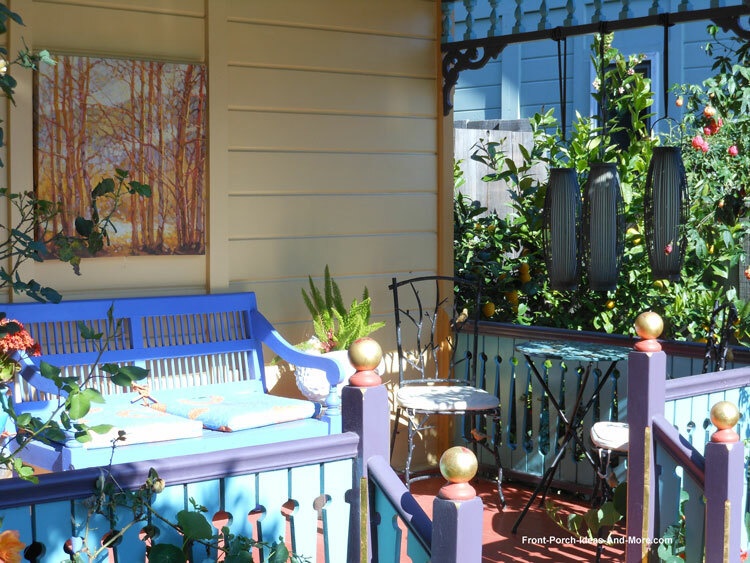 A useful decorating tip for those who like muted colors is to strategically place more colorful outdoor art or pillows on your porch. 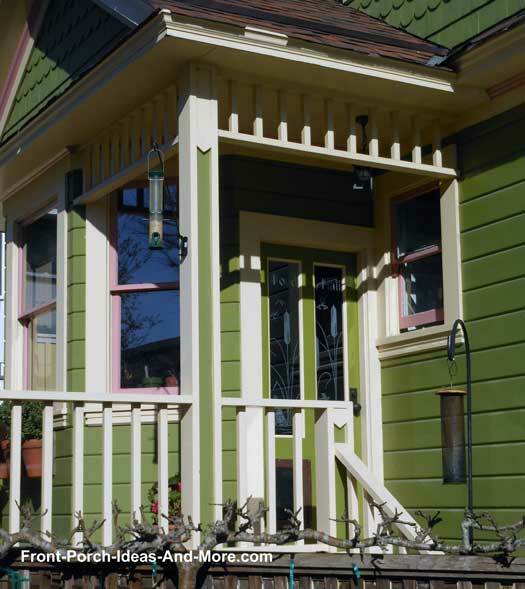 Green colors, like on the porch above, are used on small homes or bungalows. It blends in nicely in natural settings. 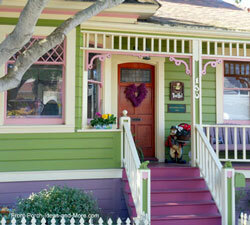 Victorian-style homes often use what is called triadic colors (or three color combinations). It is said that a red/violet, yellow/orange, or blue/green combination are perfect examples of triadic colors. 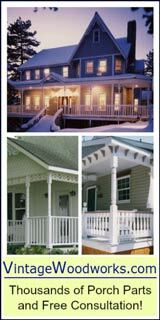 For small porches, consider using combinations of white, pastels, neutral, and beige colors which will make your porch appear larger. A darker trim color helps also. 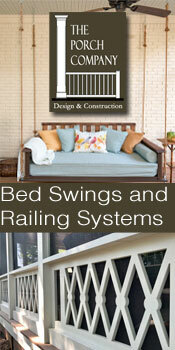 You might consider these possible combinations: pale yellow or white with dark green or yellow with dark brown trim. 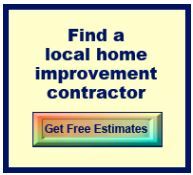 Check to see if your subdivision or area has restrictions on exterior color combinations. If not, you are free to get creative. 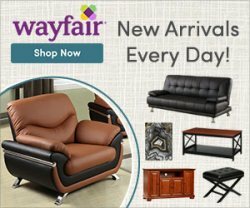 Experiment a little to find just the right shade or shades of color that you will like the most. 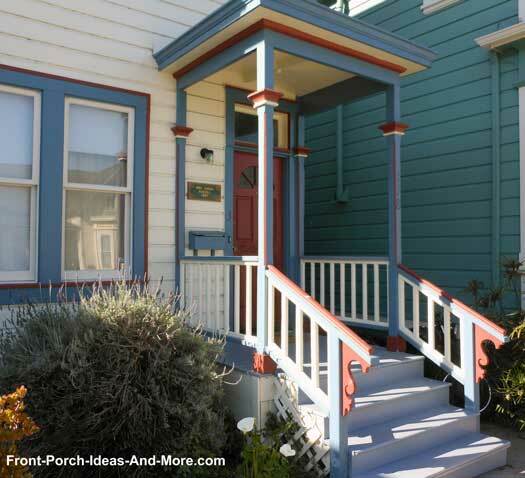 For more exterior color ideas for your porch be sure to see our porch paint section. 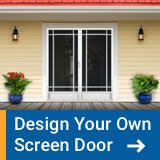 Exterior front doors, especially on small porches, can create massive appeal. 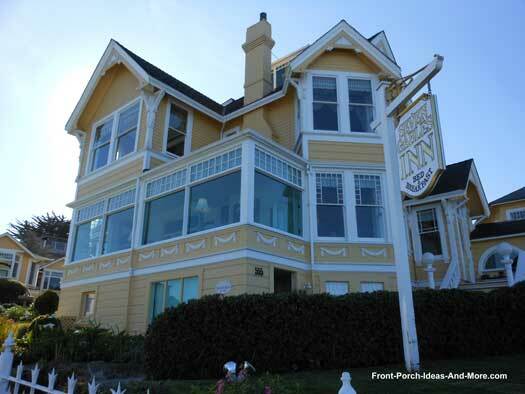 We were excited to find so many great examples in Pacific Grove to share with you. I like the side light design for this front door. 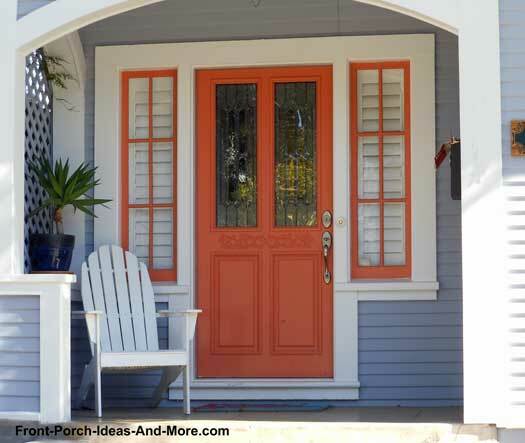 The orange color is striking against the white trim and makes this small porch pop! 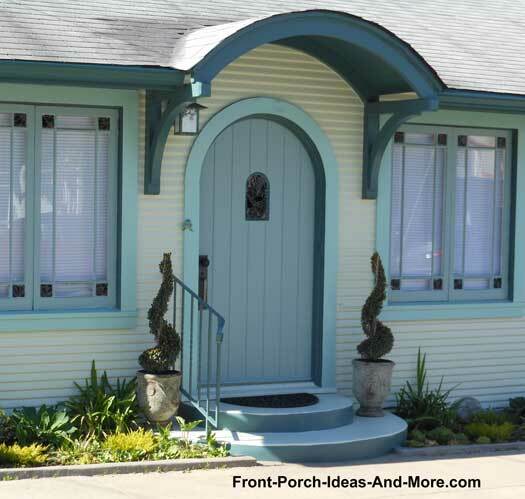 The different shades on this door and trim make it pleasing to the eye for sure. Often times, using bolder colors makes all the difference. Color is not my forte, but these colors work really well. It makes for in inviting front porch. 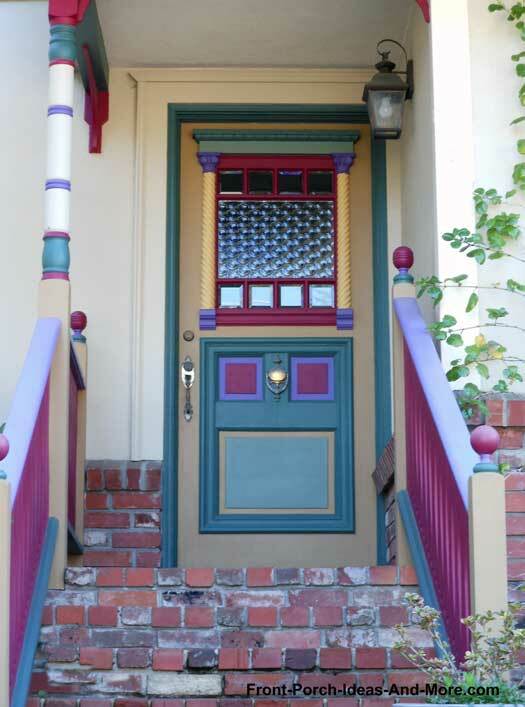 The exterior door color is carried over to the house trim creating a very cohesive look. 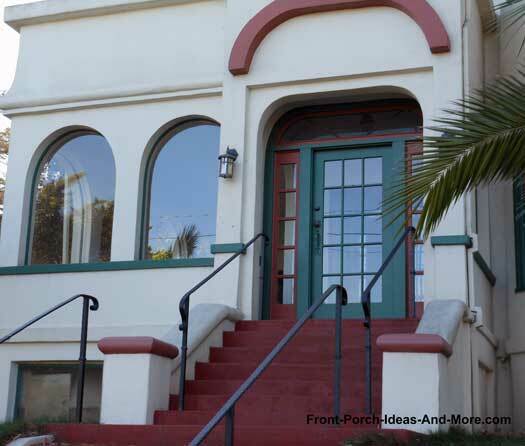 This is a beautifully unique home with lots of windows and arches. Whoever chose this door and paint scheme definitely has an eye for color. 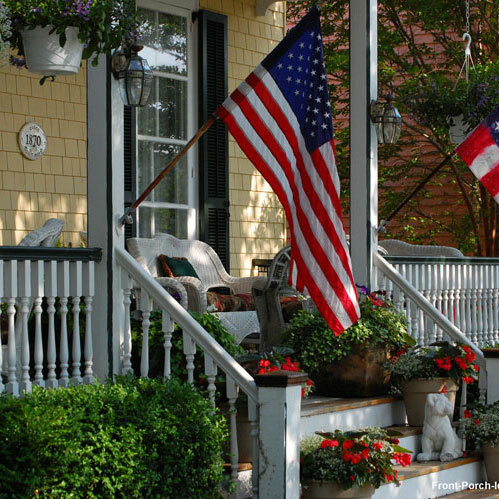 Needless to say, we did stop and admire this porch for a few minutes; it is striking to say the least. 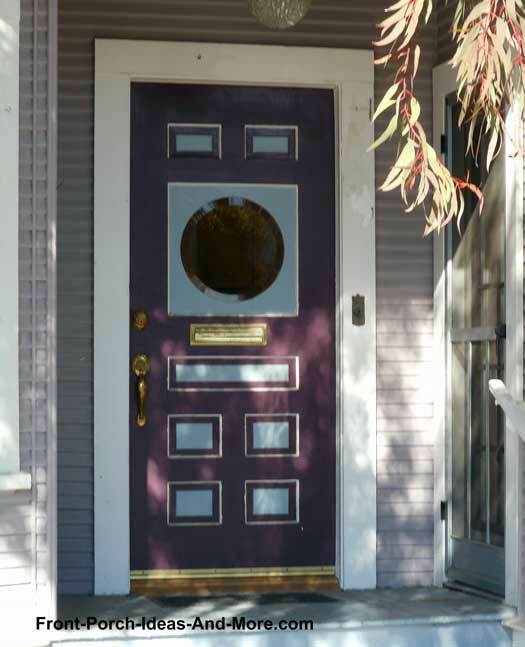 I like rounded doors and this one is pretty cool. The colors have a soft and calming effect and the roof is pretty unique too. 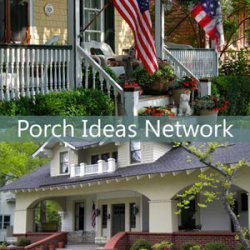 We have tons more photos of fabulous porches from Pacific Grove California and have used them throughout our site to illustrate different front porch ideas. 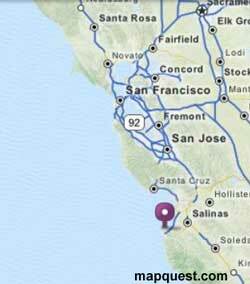 We really enjoyed our time in Pacific Grove California. It is home to the monarch butterfly migration, movie set for Turner and Hooch (love that dog), and Point Pinos Lighthouse which is said to be the oldest operating lighthouse on the western coast of the U.S.
During our stay in Pacific Grove, we stayed at the Seven Gables Inn, a most wonderful and beautiful bed and breakfast located on the ocean's edge. 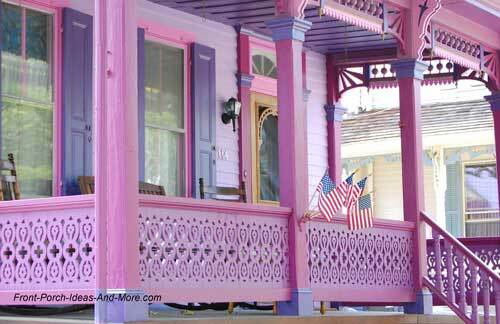 During our porch travels, we visited charming Abingdon, Virginia.